T’was an exciting month around Akismet headquarters. We caught over 300 million spam messages in just one day for the first time, on September 26. And if that wasn’t enough, we saw over 300 million comments in one day again on September 30. There were two other times in Akismet history when we broke the daily record this many times in one month. In November 2011 we broke the daily record 8 times (!) and in December 2012, we broke it 6 times. Though, the numbers were much easier to beat then – 90 to 100 million daily spam comments in November 2011, and 177 to 196 million in December 2012. We saw 7,955,568,000 spam comments go through this month, and 357,739,000 real comments. You may have also seen a rise in your own spam comments this month. If you’re noticing a larger number of comments than usual being missed by Akismet, please do get in touch through our contact form so we can help out. Let us know what your API key is, and on what website you’re seeing the increase, and we’ll be happy to take a look. 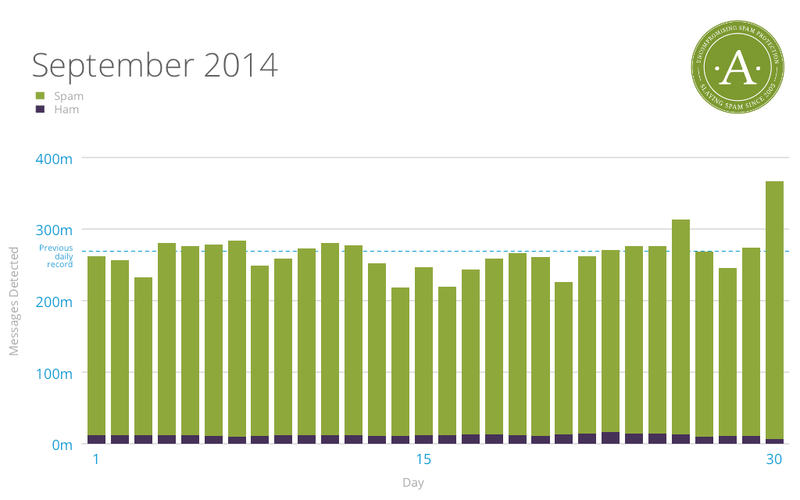 Our slowest day this month was September 14, with a mere 218 million spam comments going through. Compared with September of last year, the number of spam comments going through Akismet increased by 112%, and it increased from last month by 10%. This month, we missed about 1 in every 4,574 spams. As usual, real comments make up only a small portion of the total comments we see coming through – at 4% this month.